Description: this larger T-Rex figure measures some 25 centimetres in length and stands just over 15 centimetres tall. The sculpts stands in an attack posture, with its tail bent upwards and its head slightly tilted up. Its legs stand wide apart from each other. This Rex is pretty skinny and has little body mass, it’s mostly head, limbs and tail. A very large dino damage would is found on its right flank, showing white ribs and red muscle tissue. The upper piece of exposed rib is actually a button which activates a shrieking roar, as if the creature is in pain. A second roar, more aggressive and imposing, can be made by pulling its right arm down: when doing so the mouth will also open. A third sound, the stomping noise, can be made by having the T-Rex stomp on the ground. The sound quality of all three sounds is not very good, static is heard as well. The overall colour of this Tyrannosaurus is dark green, with a black stripe running from its snout all the way to the end of the tail and numerous smaller stripes on its back, tail and neck running out of the larger stripe. Added to these colours are some light blue stripes on neck, back, limbs and tail. A thick grey stripe runs over the belly and underside of the tail. It’s got a pair of small red eyes with black pupils and the claws on both hands and feet are light grey. The tongue and inside of the mouth are painted pink, with white teeth. A black JP III logo is located on its right upper leg. 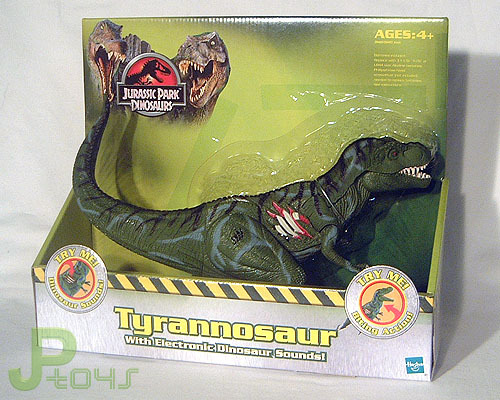 Analysis: this T-Rex would undoubtedly be regarded as the top figure of the JP Dinosaurs 2 toy line, being the biggest carnivore sculpt, but apparently Hasbro didn't think it worthwhile to do much work on it, probably under the impression it would sell well anyway so why waste additional money on it... Therefore, if this “new” paint job brings up a distinct feeling of déja vu, it's perfectly normal, considering the paint scheme is more or less identical to that of the JP III Ultra T-Rex, and the dominant colour is still green (though a darker variety of green this time). Close inspection and comparison between this Rex and its JP III counterpart reveals all the stripes and lines on both figures to be in the exact same spot, it's just the colours that vary. And to be frank, the red and brown colours looked better with green on the previous T-Rex. Light blue just doesn't suit a Tyrannosaurus at all. It's a real shame the designers put so little effort in this figure's paint job, considering its Camo-Xtreme predecessor got a surprisingly awesome new paint job that made the whole sculpt appear better than it was. The paint job, though not very different from before, is the only new feature on this Rex, the rest is the same old same old. A lousy posture hindering playability, a lame and uninspired attack feature and weak electronics that don't just sound crappy, but break all too easily, making working specimens of this figure increasingly hard to find. This may be the biggest figure of this line, but it's also the biggest disappointment. Repaint: yes. This is a repaint of the JP III Ultra T-Rex figure. The sculpt has been repainted before for Camo-Xtreme and would be repainted again for JPD3. Overall rating: 3/10. A near copy of the JP III T-Rex paint job, and zero improvement. The sculpt itself still is quite disappointing for a big figure. Like the other big JPD2/3 electronic dinosaurs, this figure was common a few years ago, but its numbers are in swift decline. You might still get one for a decent price these days, but don't expect this situation to hold much longer.